Daddy's awake! Adorable moment rescued circus lioness greets her father when he comes around after surgery. The lions were rescued from a circus in Peru where father Leo was so badly abused that he needed dental surgery to repair his mangled teeth. . When he came around he immediately looked for his daughter Africa and turned around to face her, still groggy from the anesthetic. She stretched her paw out from the fence in a bid to beckon her father towards her. . 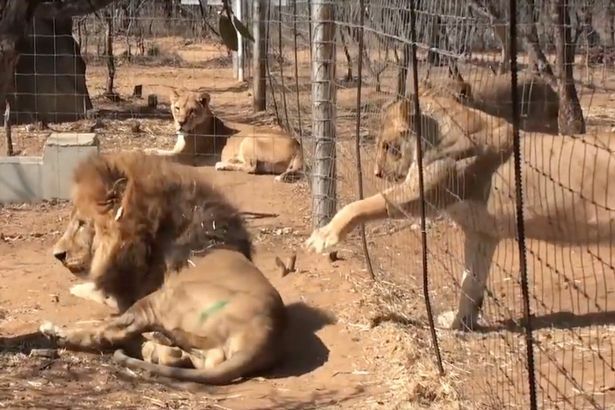 The pair then rubbed heads through their enclosure fence at the Emoya Big Cat Sanctuary in South Africa.. They are being nursed by rescue group Animal Defenders International after being airlifted to safety from South America in a crack down on wild animal circuses. Jan Creamer, president of ADI, said: 'The video shows the strength of the family bond in a lion pride. .
'We are in the process of reuniting this pride which we rescued in separate raids on circuses in Peru and soon they will be released into an enclosure of acres of African bush.' . More than 100 animals including lions, tigers, monkeys and bears were rescued as Peruvian authorities closed down illegal circuses. .
Leo was rescued eight months ago and was recently reunited with daughters Africa and Kiara in South Africa.. Responses to "Adorable Moment A Rescued Circus Lion Is Reunited With His Daughter"
That's really very adorable. Fencing is so imporatnt for safety, protection, entertainment, brought up animals, area specification and for so on. For first Class fencing this can be contacted- Commercial Fencing Calgary.